Walks are flexible and arranged to suit the needs of both you and your dog. 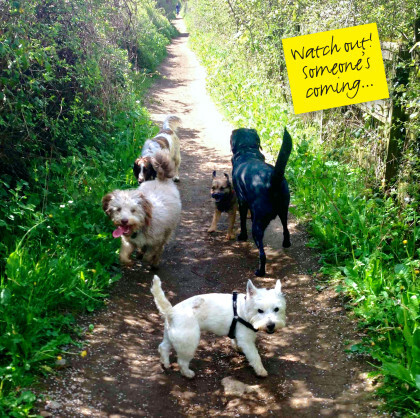 Group walks are available, limited to 4 dogs to ensure each has plenty of attention. All dogs are returned home clean* and happy! Walks vary in distance, depending on each dog. They include routes through open fields and woodland. Popular areas for dog walking include: Chippenham, Kellaways, Seagry, Castlecombe and Corsham. As safety is top priority, I always walk them well away from roads and traffic so that your dog has the freedom to explore. All dogs are exercised off the lead unless you prefer otherwise. *It’s a dog’s life will do their best to keep your dog as clean as possible during and after walks. Clients should leave out towels near entranceways that will be used for wet or muddy weather conditions. It’s a dog’s life will not be responsible for bathing or brushing dogs after walks.